There is something for everyone this month in Mexico’s Pacific Treasure, including Navy Day, the 56th San Blas Fishing Tournament, the Guayabitos Motofiesta, the Riviera Fest VW in La Cruz, the celebration of the Batalla de Santos (Battle of the Saints) in Mexcaltitán and the Texas Music Festival in Nuevo Vallarta. 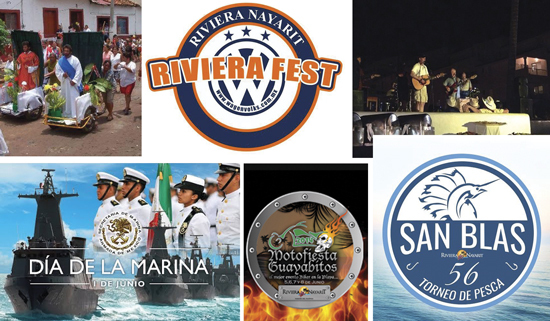 The Riviera Nayarit Convention and Visitors Bureau’s Groups and Events Department recently announced the list of events on the Destination’s calendar for June, which will take place in different locations from Nuevo Vallarta all the way to the Isla de Mexcaltitán. One of the Riviera Nayarit’s signature events, the San Blas International Sport Fishing Tournament celebrates its 55th year of adrenaline-pumping moments for lovers of deep-sea fishing. http://www.clubdepescadeportivatepic.com/. This event was born of the desire to give motorcycle enthusiasts a place where they can show off their spectacular machines to the general public and enjoy time together. http://www.motofiestaguayabitos.com/#. La Cruz de Huanacaxtle is another magnet for classic and modified Volkies. Over 150 vehicles will be displayed at the Marina Riviera Nayarit during this family-friendly event. https://www.facebook.com/clubwagenvolks/likes. This patron saint feast commemorating saints Peter and Paul includes one of the most iconic traditional ceremonies on the Isla de Mexcaltitán, the birthplace of Mexican heritage: a pilgrimage that emulates the Mexicas, or Aztecs, who left Aztlán to establish the great city of Tenochtitlán. http://www.santiago-ixcuintla.gob.mx/. This Texas-sized cultural and musical festival returns, bringing with it dozens of Texan artists and plenty of visitors who flock to Nuevo Vallarta to celebrate the traditions of the Lone Star State.